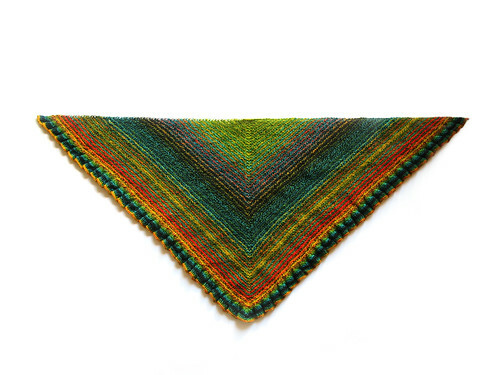 Yes, Suzie, it is most definitely possible – very easy in fact, and a technique which I have used for many projects and designs including my Simple City Shawl. Counting through my finished knitted items, I have used this technique at least nine times (if you include my current on-the-needles project) with balls of yarn that slowly transition from one colour to the next. It is quite simple, and is a fantastic way of ensuring that you make the most of your yarn without needing to cut and weigh your yarn, but there are a couple of tips which I have figured out along the way to avoid confusion and tangles. 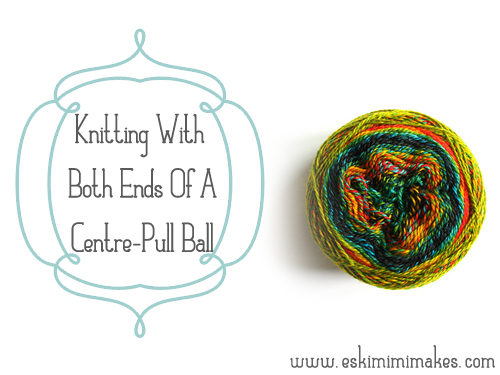 Obviously you have to start with a centre-pull skein/ball to ensure that you have two ends to work with. This might be a commercially wound ball that you can knit from the centre of, or one wound by the knitter either using a ball winder or nostepinne. When working with the end of yarn that is on the outside of the ball, place the ball of yarn so that the end of yarn that emerges from the centre of the skein is placed downwards, almost trapping the ‘dormant’ end of the yarn underneath the ball. This allows the outside strand of yarn to unwind off of the outside of the ball freely, and will not cross the other end of the yarn or cause any tangles. 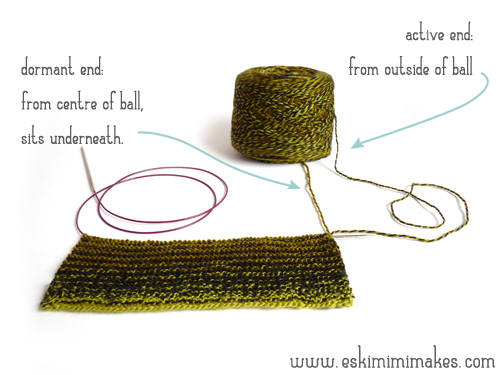 When working with the end of the yarn that emerges from the centre of the ball, flip the ball of yarn over and place it down on the end of the yarn that sits on the outside of the ball. This allows the end of the yarn that you are working with to emerge freely from the centre of the ball without causing any tangles. 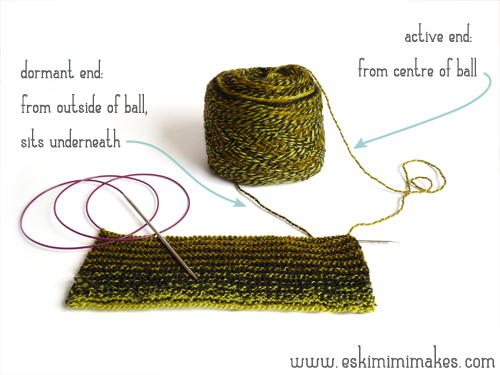 Keep turning the ball over and trapping the unused end of yarn underneath the ball when changing between ends of yarn that you are using for knitting your stripes. A similar technique can be used if you are using two ends of the same skein for knitting colour work, which is something that can be achieved with yarn that graduates from one colour to another. To minimise the risk of tangling when working stranded colourwork, keep the skein in the first position, resting on the end where the yarn emerges from the centre. As long as you are careful to free enough yarn from the centre pull skein by gently pulling it out from underneath the ball, there is no need to move the ball from this position, and as long as the same end is kept dominant when working your colourwork, the ends should have no reason to cross and tangle. Knitting & Crochet Blog Week 2013 – Join In Here! These are so pretty! – and you are so organised! And you do such lovely diagrams too. The other way to work with two ends from the same ball, of course, is the way I’m using at the moment, which doesn’t look pretty at all. Four ends, from two balls, which are just sitting in separate clear plastic bags. It doesn’t actually get very tangled at all – although it does look rather worrying at first glance! I do that sometimes. 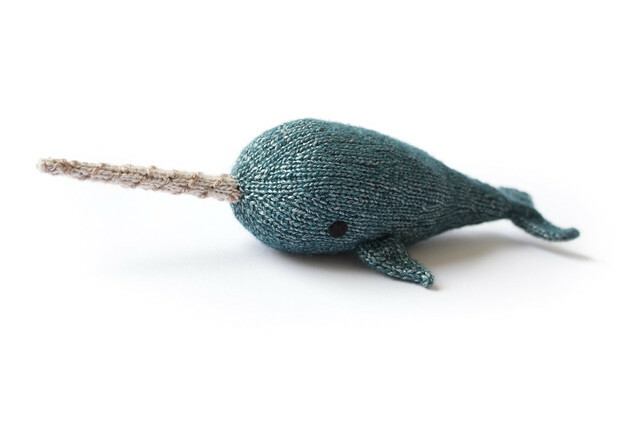 It’s a great way to use up very fine yarn that is too thin to use on its own. I’m less scientific than you. I just yank out great long lengths of both ends and knit. It works fine. 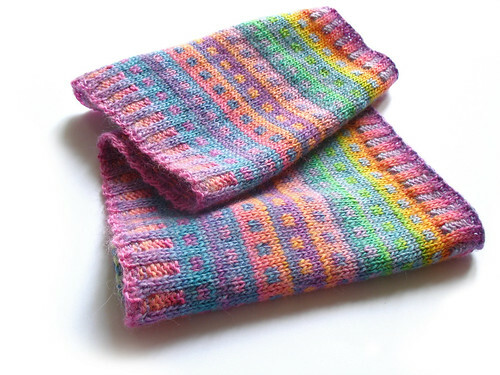 @Una: that’s a bit different though, as you are just knitting the two ends at the same time so it doesn’t matter if they twist together – with colour work though (even simple stripes) you’re usually going to want to keep them untwisted. This is just plain awesome. Thank you SO much. I’m sending some friends back to see it.